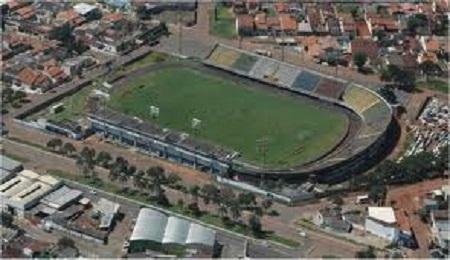 Estadio Jonas Duarte is a football stadium in Anapolis, in Brazil. It was built in 1965, and has a capacity of 14,400 people. It took a year for the construction to be completed. The first game played here was between Sao Paulo and a "Selection of Annapolis". Apart from games, the stadium also plays a host to other artists and their performances. Use AnÃÃÃ‚ƒÂ¡polis trip planner to visit EstÃÃÃ‚ƒÂ¡dio Jonas Duarte and many others to your visit. Your worry of where to stay in AnÃÃÃ‚ƒÂ¡polis is sufficed by bunch of interesting and comfortable lodging options in the AnÃÃÃ‚ƒÂ¡polis like Hotel Central De AnÃÃÃ‚ƒÂ¡polis, Itamaraty Hotel, Hotel Via UniversitÃÃÃ‚ƒÂ¡ria and Principe Hotel. Chalk out the best way to discover the city with AnÃÃÃ‚ƒÂ¡polis vacation packages. Check out various modes for how to reach AnÃÃÃ‚ƒÂ¡polis. Love this? Explore the entire list of places to visit in Anapolis before you plan your trip. Fancy a good night's sleep after a tiring day? Check out where to stay in Anapolis and book an accommodation of your choice.